Supporters of a hike in local minimum wages left nothing to chance yesterday as a city council decision on a proposal by Todd Gloria neared. 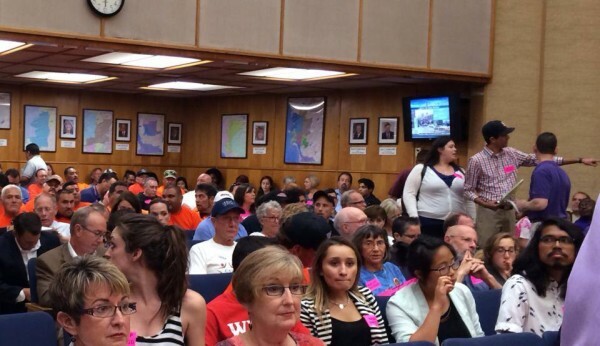 Over 400 hundred people showed up at city hall for a 6pm hearing, filling the council chambers and two overflow rooms. Many wore pink signs indicating their support. Email and social media reminders abounded during the day, including a mid-day Raise Up San Diego-led “Twitterstorm.” More than 100 people testified before the council. Highlights included former basketball star Bill Walton standing up in favor of the measure and United Foodservice and Commercial Workers’ Mickey Kasparian giving an impassioned speech. In the end, the City Council did the right thing, voting 6-3 to enact by ordinance a minimum wage hike, with raises in three stages effective January, 2015. This means the measure will not be placed before the voters in November. Additional increases will come in successive years, topping out at $11.50 in January, 2017. Starting in January 2019, further hikes will be tied to the consumer price index. The measure as passed awards full time employees up to five days a year in earned paid sick leave; part-time workers will earn prorated sick leave based on the number of hours they work. The proposal includes no exemptions for any industry or business.The Center on Policy Initiatives estimated that 279,000 workers will now earn sick leave. The Center on Wage and Employment Dynamics at UC Berkeley also analyzed the proposal and determined it will result in raises for at least 172,000 San Diegans. Further, the number of San Diegans receiving raises could be as high as 214,000 in 2017.On average, the raises will add $1,400 per year to the paychecks of employees now making minimum wage or slightly above it, resulting in an additional $260 million per year going into the pockets of low-income San Diegans, which they are expected to spend on necessities like food, shelter, and clothing, benefiting the local economy. The Center on Wage and Employment Dynamics, which specializes in estimating the impacts o local and state wage proposals, detailed additional impacts of the San Diego measure in its analysis. **An estimated 60% of people working in the local food services industry will get a raise byJanuary 1, 2017, a larger proportion than in any other industry. In sheer numbers, the retail trade industry will account for the most raises. ** Half of everyone working part-time (less than 35 hours a week) will get a raise. The really big question this morning as I write this post concerns the response of San Diego’s downtown establishment-types to this measure. There were indications yesterday that opponents of the minimum wage increase were considering various options. On the other hand, Channelle Hawken, of the San Diego Regional Chamber of Commerce, said raising the minimum wage above that of California would put the city at a competitive disadvantage. “We are already seeing and hearing from our members that have businesses that are raising prices and cutting jobs in response to the current increase in the (state) minimum wage,” Hawken said. The state minimum hourly wage went from $8 to $9 on July 1. Hawken said a recent survey of chamber members found that the proposed minimum wage increase is a bigger concern than healthcare expenses, and that 14 percent of members are considering moving out of San Diego. The Chamber of Commerce, led by ex-Mayor Jerry Sanders was supportive of two other recent efforts to overturn measures passed by the city council. Repealing a minimum wage hike may be a tougher task than overturning a community plan or rolling back developers’ linkage fees to 1990 levels. The question remains whether the downtown set’s Lie-O-Tron computer can generate enough scare stories to sway voters. One commenter in today’s UT made the prediction that San Diego would end up like Detroit. But this IS going to be a tough sell. Minimum wage hikes have been popular with voters: Since 1996, proposed increases have been on statewide ballots 15 times in 11 states — and all but two of them were successful, according to the Ballot Initiative Strategy Center, a Washington, D.C., group that supports a higher minimum wage. A Rising Tide: $15 Hour in LA? Unlike their earlier successes, the downtown/chamber types won’t be able to divorce the issue of inequality from a national context. Eleven other municipalities around the United States have passed similar ordinances, including Albuquerque NM, Seattle WA, Bernalillo County NM, Montgomery County MD, Prince George’s County MD, San Francisco CA, San Jose CA, Santa Fe, NM, Santa Fe County NM, Washington DC, and Richmond CA. …The bid to boost the minimum wage citywide follows other efforts to boost pay for some — but not all — Angelenos. The Los Angeles Unified School District recently opted to ramp up wages to at least $15 an hour for service workers such as cafeteria employees, custodians and teaching assistants. In a separate move, city officials are drafting an ordinance that would require large hotels to pay at least $15.37 an hour. But some local politicians who support that boost — including Mayor Eric Garcetti — have raised concerns about singling out hotel workers for a minimum wage increase. Nearly half of L.A.’s hourly or salaried workers are paid less than $15 an hour, according to a 2013 report by the Economic Roundtable. This is an excerpt from Doug Porter’s daily column at our sister online media partner, San Diego Free Press. That vote your elected Councilperson made last night –after public hearings, and a one-sided compromise– was “undemocratic” according to the Neighborhood Marketing Association. They’re offering up interviews of poor suffering oppressed businessmen to the lamestream media via flack Tony Manolatos this afternoon. Neighborhood Marketing Association is the group the local righties use when their planned campaign is too nasty even for the Lincoln Club. I take in approximately $200 a month less in rent than I pay out in mortgage and insurance. I’ll likely raise the rent as wages go up and people have the ability to pay more. I expect that restaurants, stores, and other landlords will do the same. I don’t see how this increase will help the minimum wage earners in the long run, but at least I’ll quit throwing away $200 a month. No worries, I’ve got that covered. The wages will increase annually in January, so I’ll just raise the rent as I renew the annual lease each June. Everyone will eventually be making about $400 a month more. They should be able to earmark $200 of that for housing; especially fair when you consider rising home values. Every other landlord will raise rents too, so continuing to find tenants shouldn’t be an issue. The workers will earn more in wages, my property manager’s will make a little more, and I’ll be breaking even on my mortgage. Everyone wins. Rents (mostly) always rise, but if you’ve got a fixed-rate mortgage your payment will be the same forever, until it’s paid off. Eventually your property will break even, and a few years after that it’ll cash flow – no worries, as long as you can afford to eat the few hundred now in exchange for the profit later. We generally index rents to CPI – if consumer costs as a whole are up 8% when a tenant moves, the unit goes back on the market at roughly 8% more than it previously cost. Unless we have a problem with perpetually late rent, failure to keep a property clean, or failure to report problems so we can fix them before they get out of hand, it’s pretty rare that we crank up rent on existing tenants more than once every four or five years (some of our units are still rented at 2004 rates). A lot of our units are rented to low-income families – I couldn’t imagine hitting them with massive hikes just because they’re making more and I want to keep all of their raise for myself. Then again, neither our privately-owned units nor the ones we manage for others are over-leveraged to the point they carry more debt than a reasonable rent can support. Thanks for proving that at least some landlords are human beings. 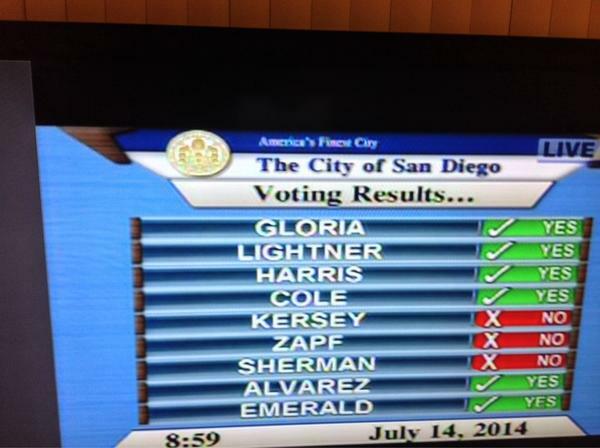 Great move by the City Council. Great activism by the people. Business that wants to move out of America’s finest city because of this are welcome to do so and we will probably be better off without that type of employer. The Mayor can veto and be over ruled. Back in 2000, entry level pay out of college was $12/$13 per hour. I just took a quick peek at craigslist and there are many entry level jobs paying $12/$13 per hour. In 2017 minimum wage is going to be $11.50. In 2018 minimum wage = entry level pay . Why go to college when you’re going to get paid the same as working at McDonalds? What about all the people making close to minimum now? If I make $5 more than minimum wage now I want to make $18-$20 an hour by 2017. Of course, businesses will pay the increases and never raise their prices…right? I mean, schools will just raise the pay on all their hourly employees – classroom aides, cafeteria workers, crossing guards, and keep all of them, and your property taxes will not go up. Yea…OK. You’re right, to make this truly fair, we should all get increases. Why stop with just the people who are close to minimum wage? I’m trying to figure out if we’ll only see the difference between current and future minimum wage, or if it’ll be a percentage. If I’m making $45 an hour, do I only get a $2.50 increase, or is it going to be $12.50? I asked a restaurant nea why prices increased and was told min wage. I will eat out less, it doesn’t matter why prices increased. My salary is the same. Probably the same for those on a fixed income. Again, No common sense here…. All prices will go up because of this and everyone will have to pay them… So how does ANYONE gain from this ?? Also, businesses will lay off people or move out of state. We have tons and tons of businesses that have already left california for one reason or another. This just gives them another reason to do so. Fact remains that Min.Wage jobs are supposed to be “kid” jobs not head of household jobs. Prices will not go up, because they are based on market, not cost. Businesses will not lay off, because they are already using the minimum number of employees that they possibly can. If businesses fold or move out of state, we are better off without them. Median age of minimum wage workers is 35. Most are the only source of income for their household, 26% have dependent children. Another popular myth is that if the minimum wage is raised, unemployment will increase. This is based on the false precept that employers have “optional” employees, coupled with the false precept that billionaires, rather than workers, create jobs. Employment will increase, not decrease, if the minimum wage is raised. Businesses will not lay people off, because they are already employing the fewest people they possibly can; businesses don’t provide jobs as a charity or community service, they hire only the people they have to hire to operate, and not one more. A few businesses might fail, because their profitability depends on the largesse of government which keeps their employees alive, when the employees’ wages are not enough to do so. The lack of such businesses would be a relief to the taxpayers. When the minimum wage is raised, the poor will borrow less, thus spending less on interest (and depriving those billionaires of yet more easy money). In addition, the poor will purchase more goods and services, because they can and they need them. Those newly demanded goods and services will require more jobs to produce and deliver, thus creating more jobs. Those newly employed people will demand still more goods and services, creating still more jobs, etc. Of course, the rise in minimum wage will price out the high school and college kids who rely on jobs to pay for college and spending money in high school. Who’s going to pay that money to kids with no work experience? Perhaps that’s just an unintended consequence and of little importance. There is already a federal minimum wage for workers under 14 – 19 years of age, for the first 90 days. Currently, it’s $4.25. The hospitality and restaurant industry are low margin businesses that provide most of the minimum wage jobs. They are dependent on their customers’ discretionary income but have to raise rheir prices to keep slim profit margins. People on a budget aren’t going to eat out as much. It is argued that the minimum wage increase is going to improve the economy, but i am skeptical that the restaurant and hospitality industries can afford to provide much of a boost. FYI, just how low margin could they be? Because they earn no sick days currently, servers in restaurants come to work sick if they are able. Your server, infected with influenza or streptococcus or even worse, is breathing, possibly sneezing or coughing, on your food.